The AMC drama made a deliberate decision to present some of its characters' most difficult choices without any moral judgment. What does it sound like to lose a connection to your own humanity? For “The Terror,” the answer came in the form of a sunlit meal around a dining table that was ordinary in every way but one. A faction of expedition survivors, thrust under the murky leadership of the enigmatic Cornelius Hickey, gather to survive by consuming one of their deceased mates. Cannibalism is a subject that rarely works as a middle-of-the-road story element. Series like “Hannibal” and “Channel Zero: Butcher’s Block” have used a heightened, stylized form of it as a way to heighten the sensory immersion of each show. But for “The Terror,” presenting this crucial moral step as an inevitable fact of survival makes it all the more unnerving. Part of what adds to the surprise of this collective act is that any decision-making happens off screen. 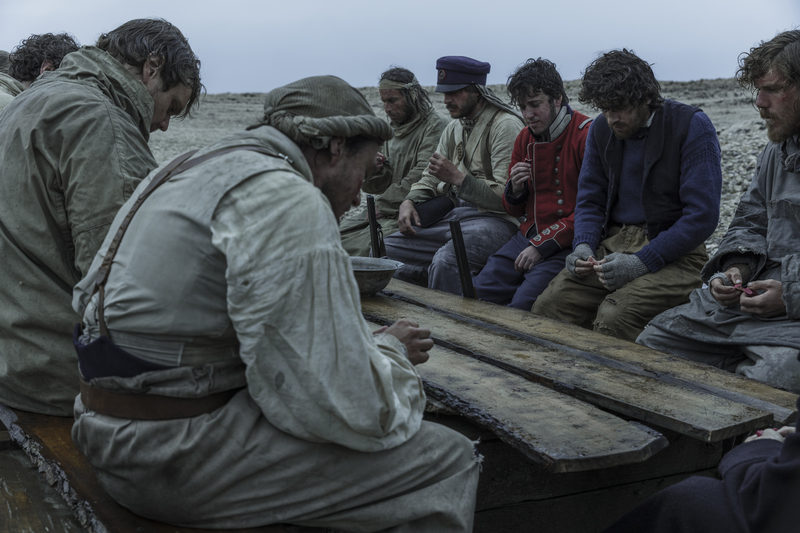 In the framework of “The Terror,” it’s a necessary means of survival, arrived at without any dramatic fireworks or fanfare. “If you look at Episode 9, it’s done very neutrally, as neutrally as possible. There’s no huge discussion about whether or not this is the route they’re going to go into,” executive producer and co-showrunner Soo Hugh said. Like many other elements of “The Terror,” there is a historical basis for this element of the story. “There have been graves found, human remains, with cut marks on the hand bones. They have a certain type of pot polish that you get from boiling bones. There’s clear evidence, so all that’s pretty factual,” series historical advisor Matthew Betts said. That objective view on an impossible decision is something that also meant a lot to Adam Nagaitis, the actor charged with bringing Hickey to life. Of course, given the point at where these men are in a doomed expedition, that’s not the only Rubicon they face. That moment around the table isn’t possible without the murder of Gibson (Edward Ashley) in the tent, seen minutes before. 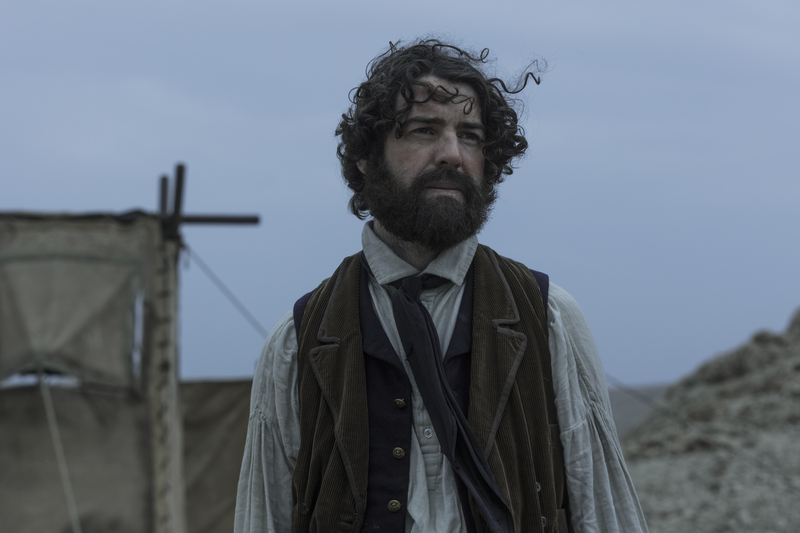 It’s a possible breaking point for Goodsir (Paul Ready), another in a growing list of atrocities — like Morfin being shot — that have now happened mere feet from his face. So even before the meal in question, Ready had plenty of other psychological considerations to make. With such a mammoth dilemma in this episode, it provides an intriguing counterpoint to the episode’s final scene: Blanky (Ian Hart), separating from the rest of his group, fulfills a major part of the voyage’s mission in the dwindling seconds. According to his map, the area he’s surveying is that elusive Northwest Passage they were charged with finding. Having survived his first deadly encounter with the Tuunbaq, Blanky prepares himself for one final tussle, covered in a coat of cutlery and smiling as he recognizes his adversary standing right behind him. “There are things in the show that we treat in a kind of an operatic way. Finding the Northwest Passage is a sort of an operatic moment of a man just sitting on gravel. But we treated it that way. We cut it that way. We scored it that way,” Kajganich said. That contrast of a sense of triumph in the face of death with the terrifying consequences of men elsewhere making the choice to live only highlights how “The Terror” consistently reframes its own notion of success. Whether it’s the framing or the question lying underneath, that concept of eating another human to stay alive is another way that “The Terror” imbues its horror with a universal question about where the limits of existence might be. It invites the audience to consider it, just as it did the men who played that question themselves. “The Terror” airs Mondays at 9 p.m. ET on AMC.